The Kaili Universal Shower Filter Kit Efficiently Eliminates Harmful Metals and Chemicals from your Shower Water - Now Includes Plumbers Tape with Every Purchase! The Kaili High Output Universal Shower Filter Kit features 5 stages of micro filtration that efficiently eliminates harmful metals and chemicals from your shower water. 90-DAY GUARANTEE: Feel more confident about your purchase and your shower water. Every Kaili Shower Head Filter is backed by our unconditional 90 day guarantee! Complete Shower Filter Kit with Bonuses: Includes 1 Five-Stage Shower Filter, 1 Filter Cartridge, Rubber Washers, Plumbers Teflon tape and easy shower installation guide. Here are a few reasons to use the Kaili Shower Water Purifier: • Shower filter removes chlorine, bacteria, heavy metals (lead, mercury, nickel, chromium), & pesticides plus stops the growth of scale, algae, fungi, and mold. • Removes and reduces chlorine, pathogens, and other contaminants • The Kaili shower system has 5 stages (carbon, ceramic, KDF 55, Cotton, and Calcium Sulfite) to remove harmful metals and chemicals + safely soften hard water for healthier skin and hair. • Kaili shower head filters are backed by our 90-day guarantee. 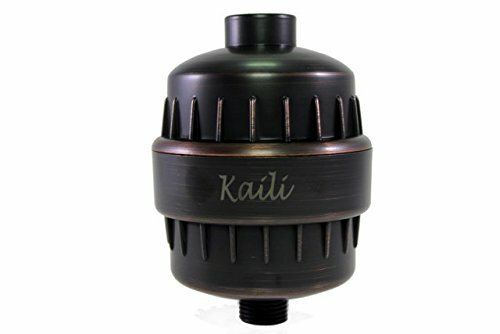 KAILI SHOWER FILTER FEATURES - Easy to install and even easier to replace filter cartridges. - Softens water for healthier skin, hair, and nails with less irritation. - Keeps shower cleaner and free of hard water spots - Durable oil rubbed bronze ABS casing WHAT'S IN YOUR WATER? The EPA has estimated that every home in the United States has elevated levels of chloroform in the air due to chlorine released from showering water. The chemical-containing water can enter your body through your pores AND your lungs by way of water vapor. More chlorine enters the body through skin absorption and inhalation while showering than through drinking tap water. Order your Kaili shower head water filter at our special low price today! Manufacturer: Shenzhen Dakon Purification Tech Co., Ltd. Publisher: Shenzhen Dakon Purification Tech Co., Ltd. Studio: Shenzhen Dakon Purification Tech Co., Ltd. If you have any questions about this product by The Pack Rat's Garage llc, contact us by completing and submitting the form below. If you are looking for a specif part number, please include it with your message.